Are you a builder in need of construction cleanup in Wilmington, Massachusetts? 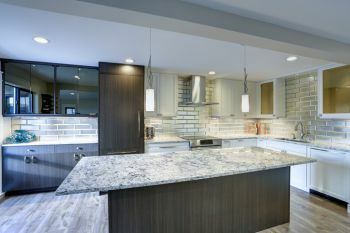 Are you a homeowner who just had your kitchen or bathroom remodeled and need to schedule a post-construction cleaning? Every construction project varies, but our dedication to cleaning Wilmington, MA post-construction jobs to perfection never will! Here at Val's Cleaning, we have been providing homeowners and contractors with the best post construction cleaning services in Wilmington, MA since 2002. You deserve for your beautiful new construction to be spotless and clean prior to moving in and adding the finishing touches. Our attention to detail, dedication for customer satisfaction and cleaning crew with over 17 years of post-construction cleaning experience is what sets Val's Cleaning apart. Dust has a way of sneaking into every nook and crevice. Fortunately, Val's Cleaning has a way of finding that unwanted dirt, dust and debris. Whether it's after new construction, remodeling or repairs, Val's Cleaning will pick up where the construction crew leaves off. Our Wilmington construction cleanup crew will ensure your newly constructed space is clean, spotless, and move-in ready. After the chaos of the messy construction work comes to an end, count on Val's Cleaning to provide the most thorough, comprehensive post construction cleaning in Wilmington. Our knowledgeable, experienced cleaners specialize in post construction cleaning after remodels, home additions, completing a building expansion, renovating a commercial space, and more. We offer a wide variety of construction cleanup services to ensure all of your needs are met to fully complete the construction project. For more than 17 years, Val's Cleaning has been the trusted and preferred cleaning company to cleanup after construction in Wilmington, Massachusetts. Our attention to detail allows us to provide a complete clean post construction cleaning service from start to finish. Give us a call today at (781) 399-4009 for a free quote.